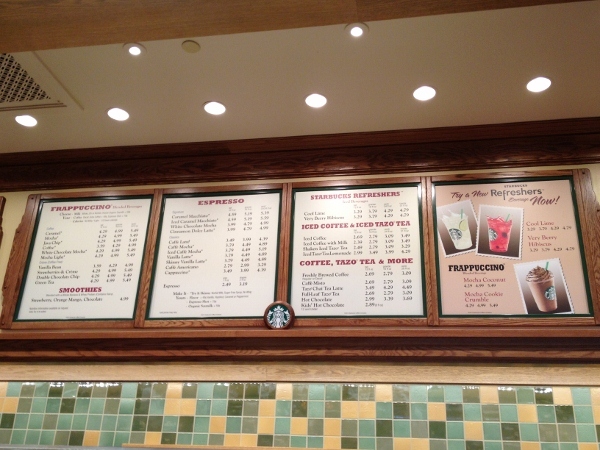 Vote in our survey and let us know what you think about Starbuck on Main Street! Let me raise my hand. Hi! I was one of them. Yup, I asked, even begged over the years for better coffee at the Disney theme parks. It was a mission of mine most mornings to seek out a good cup of coffee other than the normal and abundant Nescafe brand served across property. When the announcement that Starbucks would come to the U.S. Disney theme parks I was overjoyed. Although I’m not a huge Starbucks fan (their coffee is a bit too strong for me) it was a much better option than the current Nescafe coffee served to guests each day. But, nothing would prepare me for what Disney had up their sleeve for incorporating these Starbucks locations in the theme parks. Most everything Disney said in their initial announcement several months ago seemed right on target. They’d incorporate these Starbucks locations in the parks without compromising the theming and be very careful not to hinder the visual surroundings. In other words, you may not see the normal Starbucks green and white logos or the normal uniforms worn by Starbucks employees. These locations would look like how Disney would want them to look based on their location. Sounded good to me. Fast-forward to this past summer where we saw the first Starbucks open in a U.S. Disney park at California Adventure in Disneyland. 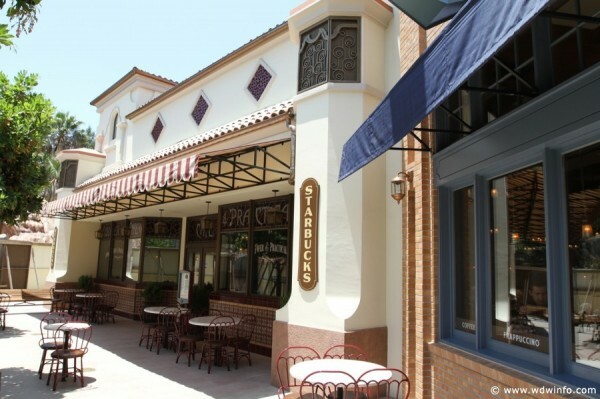 The coffee shop is located along Buena Vista Street near the front of the park. It seems like a good location and fits the theme and surroundings very well. Why not place it there? California Adventure and Buena Vista Street haven’t been around long enough to really form a legacy or tradition by guests. Placing a Starbucks there seemed like a good fit. Fast-forward again to October when rumors started swirling about Starbucks going into the Main St. Bakery at the Magic Kingdom and Starring Rolls at Disney’s Hollywood Studios. They were only rumors (Starring Rolls is still a rumor), but a little bit of concern started to creep into my mind. Surely Disney wouldn’t completely overhaul these locations with Starbucks coffee and pastries. They had to only be considering merging Starbucks with these locations, or at least I hoped. Taking away some of our most beloved treats and pastries like the Butterfinger cupcake, giant ice cream cookie sandwich, or the larger-than-life hot cinnamon roll and replacing them with Starbucks pastries would seem incomprehensible. Let’s move forward to Friday, November 9th. Disney officially announced the Main St. Bakery and EPCOT’s Fountain View Lounge would become Starbucks locations. The official Disney blog mentioned and pretty much confirmed these locations would serve Starbucks coffee, pastries, artisan sandwiches, and some of our favorite Disney treats. For me, losing the Main St. bakery to Starbucks is one thing, but potentially removing some of our favorite pastries and treats is taking it to another level. Disney fans immediately reacted to the news by taking to social media outlets and expressing their sincere disappointment about losing the iconic Main St. Bakery to Starbucks and their delicious treats and pastries. After the frustration wore off and reality began to set in I started thinking about the Main St Bakery’s next door neighbor, the Plaza Ice Cream Parlor. Whether we want to believe it or not, it’s an Edy’s ice cream outlet. Guests flock into the ice cream parlor everyday for an ice cream treat not giving it a second thought that it’s commercialized with Edy’s brand ice cream. Will this Starbucks location next door get the same patronage and popularity? You bet it will. We may be disappointed with the announcement, but guests will still stop in to enjoy their favorite cup of hot or cold coffee and a Starbucks food item. But, let’s not panic here! There is some information we don’t really know for sure. Although Disney might be removing some of our favorite and beloved treats out of the Main St. Bakery and the Fountain View Lounge at EPCOT it seems they could be relocating them to other outlets inside the parks. For example, the yummy hot cinnamon rolls are available in Gaston’s Tavern in the Enchanted Forest area of the new Fantasyland. The giant ice cream cookie will be served at Sleepy Hollow in Liberty Square and the Plaza Ice Cream Parlor on Main Street. Another possibility is that the current menu at the Main St. Bakery may stay mostly intact. According to the official Disney Blog, as of today, they said that the Main St. Bakery will still serve the brownies, cookies and seasonal cupcakes that they currently offer. Like most of you, I really wished they would have picked a different location other than the Main St. Bakery to place a Starbucks, but I can get over it. I just don’t like the idea of losing our favorite treats at a great location along Main St USA (if that happens). Eating a warm cinnamon roll while hearing the Main St. Singers when the park opens is really magical. If Starring Rolls should end up a Starbucks at Hollywood Studios I’ll feel disappointed as well (I love that location), but I’m sure The Writer’s Stop could still serve our favorite pastries or maybe Starring Rolls would keep a lot of their current menu items. In the end we could possibly see our favorite locations like the Main St. Bakery, Fountain View Lounge, Starring Rolls (rumored), and an Animal Kingdom outlet change their name to Starbucks. The inside of these locations will look a bit different with non-traditional Starbucks signage, but still keep to the theme around them. 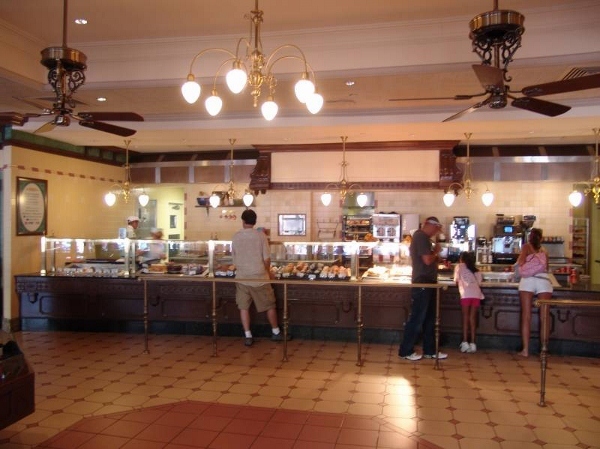 Our favorite pastries and treats could be moved out of these locations and displaced at other eateries throughout the parks, or they could stay in at the same location. In the end, I guess that will be ok. What we could lose is the convenience of our favorite treats at one location and eating them in a spot inside the parks that is very magical. Are you in the mood for a warm cinnamon roll? Head to the New Fantasyland. Are you craving a giant ice cream cookie sandwich? Walk next door to the Plaza Ice Cream Parlor or over to Liberty Square. I’d love a Butterfinger cupcake. Let’s go over to the Writer’s Stop. These are the sacrifices we may have to make. However, the truth is we really don’t know for sure until the menus are posted. I know Disney has commercialized the theme park experience even further with the inclusion of Starbucks, but the bit of good news is a good cup of coffee is now available at a convenient location. Isn’t that what most of us have been wishing for quite some time? The phrase “Be careful what you ask for” seems to come to mind. We got what we wanted, but we didn’t get it exactly how we wanted.